Can LePage’s ‘right-to-work’ plan grow Maine’s economy? 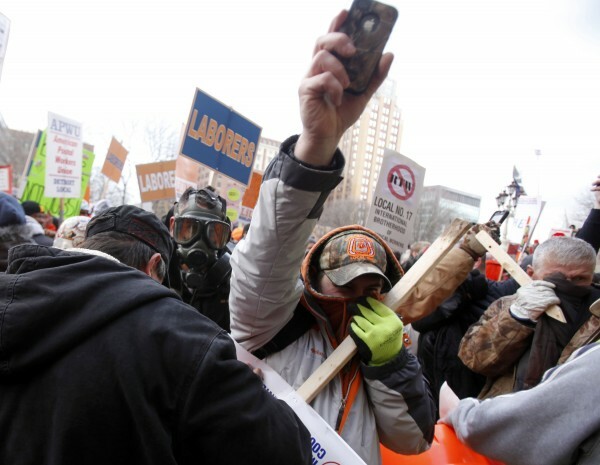 People protesting a new right-to-work law gather outside of Michigan's state capitol in Lansing on Dec. 11, 2012. Michigan became the 24th state with a right-to-work law. Gov. Paul LePage launched the latest salvo this week in an age-old debate over what impact, if any, right-to-work laws play in growing state economies and driving employee wages up or down. On Monday, the Republican governor outlined his plan for Open for Business zones, which he says will make Maine attractive to big businesses that might locate in the state, hire at least 1,500 people and invest more than $50 million. The Open for Business zone plan would wipe out corporate income taxes and lower utility rates for qualifying businesses that set up shop in the specified areas. Those businesses also would receive state help as they search for qualified workers and capital. For LePage, though, the main sweetener is a “right-to-work” law that would apply only to those qualifying businesses locating in the special zones. The law would free employees who don’t belong to a union of the obligation to pay fees for union representation in collective bargaining. Some 24 states now have right-to-work laws, and LePage has sought to make Maine one of them since he took office in 2011. Lawmakers, however, twice have rejected right-to-work legislation. For decades, anti-union advocates and Republicans have claimed right-to-work laws have the power to propel economic growth. Democrats have attacked the laws as measures meant to undermine the bargaining and political power of unions — which overwhelmingly support Democrats — and claimed they drive down employee wages. It’s notoriously difficult for researchers to pinpoint the role right-to-work laws, apart from other economic conditions and policies, play in shrinking or growing state economies or driving employee wages up or down. But recent research that attempts to do just that finds right-to-work laws have little to no impact — throwing claims from both sides of the debate into question. Part of the 1935 National Labor Relations Act, passed amid a wave of New Deal legislation as the nation attempted to recover from the Great Depression, allowed workplaces to become “closed shops” where employees could be required to join and financially support unions. Eight years later, Congress walked back that part of the labor law, allowing some employees to opt out of union membership and union dues. But the 1947 law, the Taft-Hartley Act, left it to states to choose whether to implement the provision. Those that chose to implement it did so through what became known as “right-to-work” laws. Some states already had such laws on the books before 1947. Nevada law has barred “closed shops” since 1911. North Dakota passed a right-to-work law in 1935. Six more states joined the right-to-work ranks in the years leading up to the Taft-Hartley Act. Then, that legislation propelled four more state right-to-work laws in 1947. The first states with right-to-work laws were largely those without large concentrations of industry at the time and without high union membership; they were concentrated in the country’s Southeast and Plains regions. In Maine, state law doesn’t allow compulsory union membership as a condition of employment. Employers and unions, however, can require that all members of a bargaining unit covered by a labor contract financially support the union. In 2013, 13.1 percent of Maine’s workforce, or 75,000 people, was represented by a union, according to the U.S. Bureau of Labor Statistics, compared with 14.3 percent in 2003. Some 11.1 percent of Maine workers, or 64,000 people, were union members. Today, union membership nationwide has declined from a 1950s peak to the point where just 6.7 percent of private-sector workers belong to the organizations. The public sector claims 35.5 percent union membership. Over time, advocates on both sides of the issue have amassed bodies of evidence to make the case for right-to-work laws or against them. In recent years, proponents have pointed out, right-to-work states have added jobs and population and recovered from the recession more quickly than states without right-to-work laws. When adjusted for differences in cost of living, wages in right-to-work states also have caught up and taken over in some instances. Opponents point out that grouping together statistics for the more than 20 right-to-work states obscures wide variations in economic performance and wages. They also point to a range of indicators — such as health insurance coverage, poverty rates and per-capita gross domestic product — that they say favor states without right-to-work laws. “The only sure conclusion is that whatever preconceived notion an individual or group brings to the policy discussion is likely to find supportive theory,” Ball State University economics professor Michael Hicks wrote in a 2012 paper examining the impact of right-to-work laws on states’ manufacturing sectors. The evidence often highlighted in the political debate doesn’t prove right-to-work laws’ impact on economic performance. And researchers have struggled over time, largely until recently, to isolate right-to-work laws as the single factor to evaluate for economic impact. In some cases, researchers have used “right-to-work laws” to represent an entire slate of business-friendly policies. Hicks focused his 2012 paper on the manufacturing sector because manufacturers commonly have been unionized and they’re the type of enterprise that can relocate to new jurisdictions. He adjusted for a number of factors in an attempt to create genuine comparisons among right-to-work and non-right-to-work states. “RTW legislation does not affect the size of the manufacturing share, inflation-adjusted wages for manufacturing workers, employment in manufacturing nor worker wage rates,” he concluded. Three Michigan State University labor relations professors — Dale Belman, Richard Block and Karen Roberts — found similar results in a 2009 analysis that examined three years of economic activity in an effort to determine the role played by right-to-work laws. Factors that proved influential in driving economic growth were generally high wage levels and “human capital accumulation” — which represented the earnings and education of the workforce. High wage levels spur people to enter the labor market, help their employers grow and contribute to consumer demand, which spurs additional growth. In addition, higher wage levels force employers to become more productive, which enhances their ability to compete. On the other hand, levels of union members, “right-to-work laws and taxes seem to have no effect on economic activity,” the researchers concluded. While research shows right-to-work laws have little to no effect on economic activity, the decision to become a right-to-work state clearly matters. States with right-to-work laws advertise them; right-to-work states get a boost in business climate rankings such as Forbes’ and CNBC’s; and resources that help corporations with site selection highlight states’ right-to-work status. Each year, Site Selection magazine surveys corporate officials involved in site selection. In November 2013, they identified “union activity” as the ninth most important criterion in making a location decision. “Existing workforce skills,” “transportation infrastructure” and “state and local tax scheme” were the top three concerns. “There are plenty of factors that might be more top-of-mind to some corporate location specialists than union activity or right-to-work laws,” said Adam Bruns, Site Selection’s managing editor. That’s not to say right-to-work laws don’t factor into some corporate decisions. When Indiana and Michigan adopted right-to-work laws in 2012, they both encountered new corporate interest in locating facilities in their states. “It really comes down to individual companies, individual jurisdictions and individual projects, sometimes, in terms of the requirements of that operation,” said Bruns.